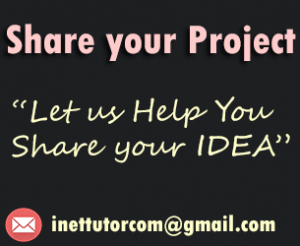 The purpose of this study is to propose an Automated Grading System in Visual Basic and MySQL for Information Technology Department Listed below are the opportunities that can be obtained when using Automated Grading System. Speed in processing grades of the student. 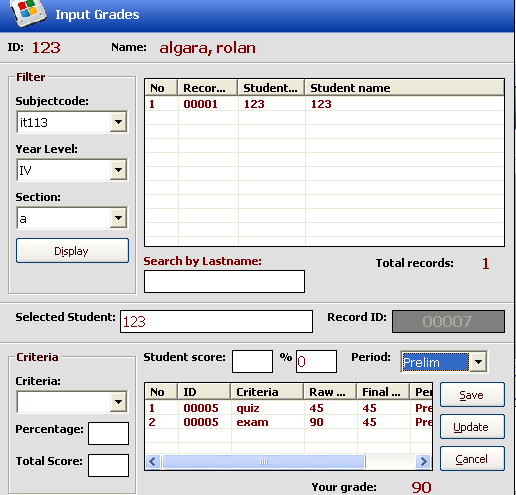 Accuracy in calculating the grades of the student. Less of paper will be use. No hassle for the faculty in processing and calculating the grades. The following are the list of features of our Inventory Management System. 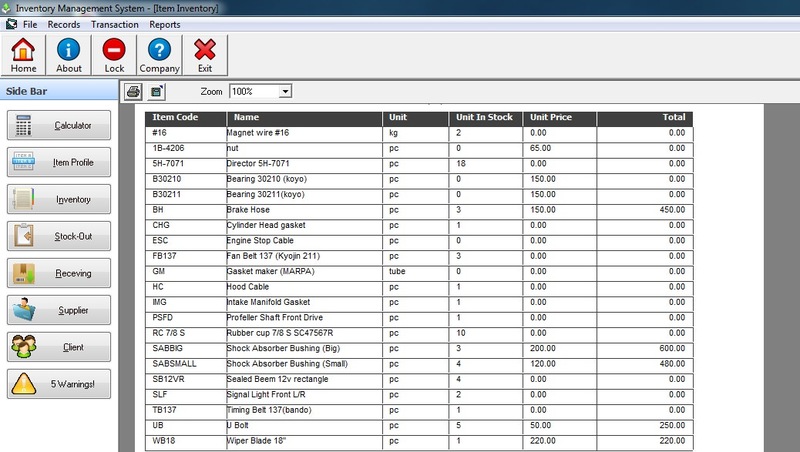 The Inventory Management System has four (4) main menus; File menu, Records menu, Transaction menu and the Reports menu. Backup and Restore – backup feature allows the user to back up the records or database of the system while restore option will allow the user to return or recover the previously stored records. Change Password – this option will allow the currently logged in user to modify or change its password. Logout – this will close or exit the application and return to the login form. Enrollment is one of the busiest schedule on every institution especially on the cashiers section. It is a challenge for them on how to make the enrollment process smooth and with precision. A manual process of enrollment procedures is time consuming and are prone to errors. The both sides are affected with these problems (students and the cashier personnel), thus the researchers would like to study, design and develop an automated enrollment system that will provide a more convenient ways to cater the needs of the students and as well as the cashier personnel. Due to manual process, some significant errors cannot be avoided. Patients Medical and Dental Record System is a kind of system that will greatly improve the productivity of medical personnel. It provides guidance and support decision to prevent errors and effectiveness of services. 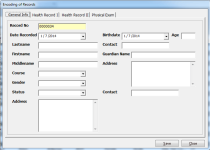 This system can also provide easy data retrieval, record keeping, a quarterly and annual graphical report of health record report that is needed for decision making and a real time records for the management. The CFES or the Computerized Faculty Evaluation System will give way to easy collection and more accurate data analysis of faculty evaluation in lesser time. 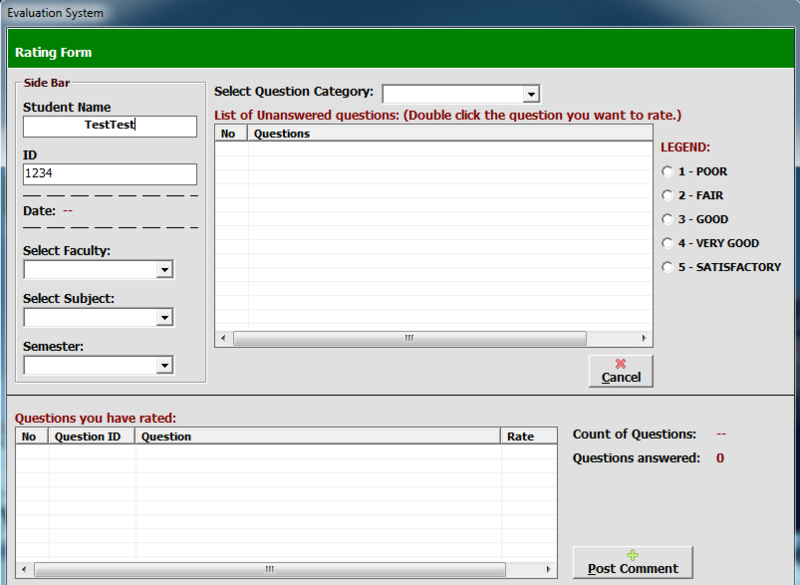 The Computerized Faculty Evaluation System is a paperless process in which the evaluator (students, co-teacher, and supervisor) will use the computer and the system to evaluate the teacher. Teaching performance evaluation is a necessary step in ensuring good instruction. Traditionally teaching performance evaluation is used as a tool to apprise teachers on how they are doing their job. Performance is defined as a set of outcomes produce during a certain period of time, and does not refer to the traits, personal characteristics or competencies of the performer. It is designed to identify teaching strength and weaknesses. Create a C# program that allows the user to add and remove items in a listbox control. We will first define what a listbox control is. 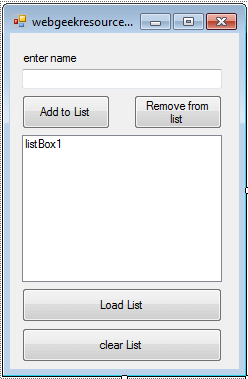 A listbox is a graphical control that displays the list of items and allows you to select an item from the list. This tutorial will teach us on how to add, remove, load and clear items from the listbox. 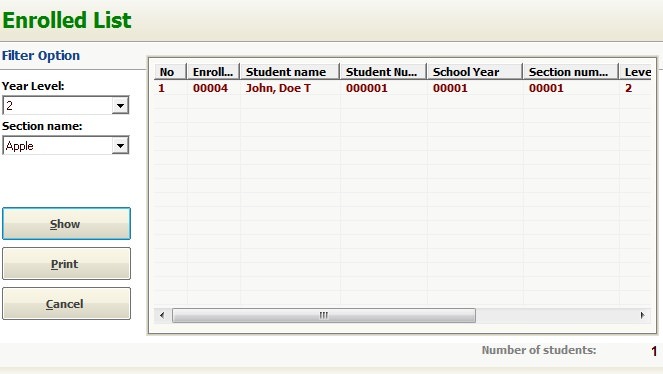 The program will allow you to enter a string, a name to be specific and add or save it in the listbox, the listbox will display all the names added by the user. You can also select an item you want to remove or delete from the list.